Silicon Dioxide, Citric Acid, Natural And Artificial Blueberry Flavors, and Sucralose. As a dietary supplement, mix one scoop (25 grams) into 12-16 Oz of cold water to taste in a shaker cup 15-20 minutes prior to workout. Do not exceed the suggested daily dose. This product contains caeine and methylxanthines. In certain people, consumption of caeine causes serious health eects, such as anxiety, palpitations, irritability, difficulty sleeping and stomach complaints. Consult your physician prior to using this product if you are pregnant, nursing or taking medication, under the age of 18, or have a medical condition. Discontinue its use two weeks prior to surgery. Limit or discontinue any other products containing caeine during use. 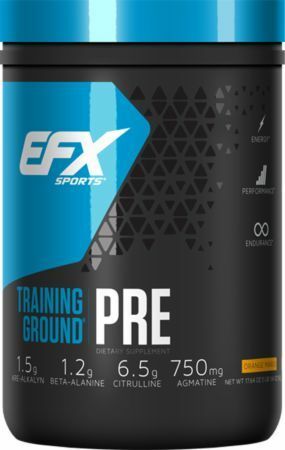 Do not consume Training Ground® PRE within 4 hours of bedtime as the stimulant matrix may cause sleeplessness. Reduce or discontinue use if sleeplessness, tremors, dizziness, nervousness, headaches or heart palpitations occur after use. This product is ONLY intended to be consumed by healthy adults 18 years and older. Keep out of reach of children. Silicon Dioxide, Citric Acid, Sucralose, and Natural And Artificial Orange-Mango Flavors.